(Nanowerk News) The nervous system’s circuitry is linked together via intercellular junctions known as synapses, and signal transmission across these connections depends on neurotransmitters—specific chemicals that directly deliver excitatory or inhibitory signals from one neuron to another. Schematic diagram of the mGluR1 sensor. Cyan (CFP) and yellow fluorescent proteins (YFP) were inserted into the intracellular domain of mGluR1β (top). Receptor molecules form dimers, and binding of glutamate (red dots) induces a rearrangement associated with an increase in fluorescent FRET signal (bottom). L-glutamate, the most widely used excitatory neurotransmitter in the central nervous system, acts in part through proteins in the neuronal membrane called metabotropic glutamate receptors (mGluRs), which belong to the larger family of G protein-coupled receptors (GPCRs). GPCR signaling governs numerous essential cellular functions and has been closely studied, but little is known about the kinetics of mGluR activity. To dissect the dynamic behavior of these proteins, Thomas Knöpfel’s team at the RIKEN Brain Science Institute in Wako collaborated with University College London investigator Païkan Marcaggi to develop an effective tool for monitoring activation for one such receptor, mGluR1, in real time ("Optical measurement of mGluR1 conformational changes reveals fast activation, slow deactivation, and sensitization"). 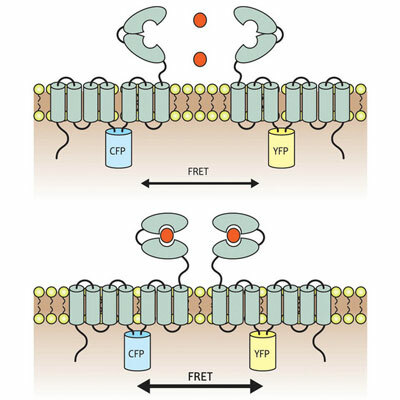 mGluR molecules act in pairs; each features a large ’Venus Flytrap module’ facing outward from the cell, which clamps shut when it binds glutamate and triggers rearrangements that bring the intracellular portions of the two receptor molecules closer together. The team used a method called FRET, in which these intracellular domains were labeled with molecules that only generate a fluorescent signal when in very close proximity to each other. Knöpfel and colleagues were able to monitor receptor activity in living cells with unprecedented precision. They found that the receptor was capable of surprisingly rapid, concentration-dependent activation in as little as 10 milliseconds—faster than any other known receptor of this type. Deactivation, on the other hand, was slower, occurring on a time-scale of approximately 50 milliseconds. Interestingly, they noted that prolonged exposure to glutamate actually increases the sensitivity of the receptor to its ligand, in marked contrast to the desensitization typically observed in such receptors. ”Our study reveals a new biophysical property that may be shared by other GPCR receptors,” says Marcaggi. Based on this finding and the slow deactivation rate, the researchers were able to develop a model for receptor activity in which mGluR1 signaling behavior relates primarily to overall duration of glutamate release rather than fluctuations in local neurotransmitter concentration.